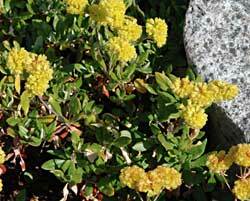 A spreading perennial with a crown of prostrate branches forming mats up to 2 feet wide. Spoon shaped leaves are greenish above and gray, woolly below. 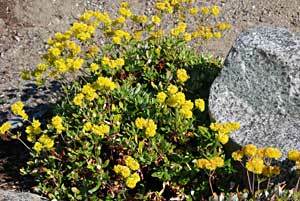 Flowers are light to deep yellow on compact clusters atop 3″-12″ stems. Found on rocky ridges and slopes.